I've never read anything by Ayn Rand but I have always been aware of her books The Fountainhead and Atlas Shrugged, the former being on my To Read list. 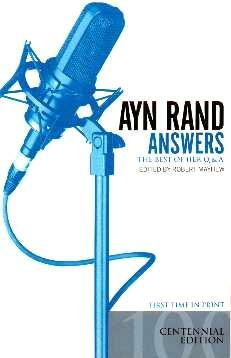 I now know they were novels that contain her philosophy, Objectivism. This book contains the questions and answers recorded at her lectures, and covers subjects like Love and Marriage, Crime and Punishment, Prostitution, Pollution, the Middle East, Capitalism, Suicide, Chess, Literature, Homosexuality, Racism and Feminisim, Modern Art, Richard Nixon, Mark Twain, and much more, giving the reader a broader understanding of the woman herself and her beliefs. This is an extremely interesting look at Rand's take on life and she often gives the "wherefores" in her replies. Her way of thinking, and explaining, how capitalism should work, gives one pause for thought. Much of what she says makes sense and is worth getting into for more detail. There are some ideas I found hard to swallow, one in particular being on altruism: "My defense of capitalism is based on individual rights, as was the American Founding Fathers', who were not altruists. They did not say man should exist for others; they said he should pursue his own happiness". Born in Russia in 1905, Ms. Rand died in New York in March 1982. I'm not 100% sure what Objectivism is all about but I have a better understanding: People (adults) should be free to make choices for themselves, not ones made by a government for them. In some instances this makes a lot of sense - i.e. if someone wants to harm themself by taking drugs or comitting suicide, let them. I agree as they are the ones who will pay the price in the end. Conclusion - It's a lot to digest and can be pretty heavy going, but very interesting.